Kamala Harris is no far-left gadfly. 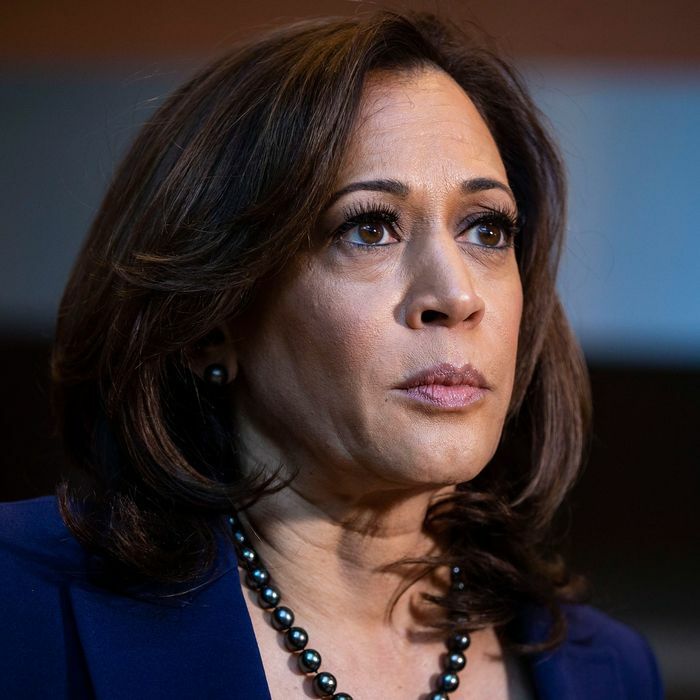 In her long tenure as a California prosecutor, Harris routinely mocked the naïveté of progressive activists whose antipathy for incarceration (supposedly) made them complacent about violent crime. She entered the Senate with strong support from California’s Democratic Establishment, and entered the 2020 presidential race with the backing of many big-dollar Clinton donors. Few would call Harris a moderate. But few would call her a progressive darling, either. In fact, in a recent interview, Hillary Clinton suggested that “the left” was Harris’s adversary. And yet, on Monday night, Harris went on national television and called for the abolition of the private insurance industry. The senator had long been a co-sponsor of Bernie Sanders’s single-payer bill. But her total lack of equivocation about what that legislation actually entails caught many off guard. Asked if her message to the public was, in so many words, if you like your private insurance, you can’t keep it, Harris did not flinch. This headline briefly put the universe back in order. Harris’s equivocation was belated but inevitable. She wasn’t going to run as an unusually forthright and unapologetic advocate of single-payer. After all, the elimination of private insurance isn’t merely opposed by powerful corporate lobbies, but by a large majority of Americans in the Kaiser Family Foundation’s polling. This is not a position a savvy operator like Harris would wish to champion. From here on out, the senator would say the three magic words (Medicare for All) but avoid defining them whenever possible. The fact that Harris has co-sponsored more incremental health-care bills is neither news, nor indicative of a lack of commitment to single-payer. Bernie Sanders has also signed onto such bills over the past two years. It is possible that her adviser’s decision to mention such bills — in this context — is a leading indicator of some future act of triangulation on Harris’s part. But that interpretation is supported less by Sams’s actual quote than by CNN’s framing of it (“As the furor grew…). And without access to the text of the question Sams was responding to, it’s impossible to assess whether there is anything remotely telling about the adviser’s reference to incremental bills. Regardless, when politicians wish to “walk back” a position they endorsed on national television, they do not typically have an adviser give a quote that reaffirms their support for said position. What Harris says on CNN carries a lot more weight than what Sams says in a single clause of a print interview. All this said, CNN’s story does point to a rational source of anxiety for single-payer proponents: It won’t be hard for a Democratic candidate to campaign on Medicare for All, and then, once in office, claim that she simply doesn’t have the votes in Congress — not least because she almost certainly won’t. To begin with, Democrats will need to win an uphill battle just to eke out a one-vote Senate majority in 2021. And since the upper chamber gives wildly disproportionate representation to right-leaning rural areas, that majority is likely to rely on the votes of conservative Democrats like Joe Manchin and deficit hawks like Jon Tester. Meanwhile, even if every Senate Democrat learns to stop worrying and love the nationalization of the health-insurance industry, single-payer won’t pass unless they also abolish the filibuster. And even progressive Democrats like Kirsten Gillibrand appear too enamored with Senate norms to do that. In other words: Single-payer advocates will need to beat the private insurance industry (and Big Pharma, and many associations of physicians and hospitals who fear single-payer’s cuts to provider rates) on a legislative playing field heavily tilted in the latter’s favor. The insurance industry will enter this battle with almost unlimited funds for stoking the public’s well-established loss aversion on matters of health-care policy; the energetic, grassroots support of (many of) their own workers; the sympathy of many American labor unions that prize the private health benefits they bargained for; and, if Kaiser’s polling is to be believed, the support of nearly 60 percent of the public (on the narrow question of whether their industry should be eliminated). The nationalization of well-entrenched industries — outside of wartime or economic crisis — is a rare occurrence in all capitalist democracies. And America’s political institutions were specifically designed to prevent the passage of such radical reforms. A Democratic nominee who genuinely believes in single-payer — and is willing to advocate for it loudly and clearly, in hopes of mobilizing the kind of mass movement necessary for passing it — would surely do more to advance the cause than one who abandons the policy after winning the primary. But president Bernie Sanders’s prospects of signing Medicare for All into law don’t appear much better than president Biden’s (let alone president Harris’s). None of this means that single-payer isn’t worth fighting for. In substantive terms, Medicare for All is likely the most realistic means of achieving — and sustaining — genuinely universal health care. In both moral and tactical terms, it makes sense for single-payer advocates to keep holding candidates’ feet to the fire. But while they’re doing so, they’d be well-advised to shift some of their focus toward extracting commitments on Executive branch policy. Harris didn’t flip-flop on Medicare for All. But for the reasons outlined above, her endorsement of the policy doesn’t mean all that much. Once in office, she’ll have a thousand plausible alibis for putting it to sleep. But on matters of Executive authority, 2020 candidates won’t have that option. You can’t claim to support a policy — but be open to other approaches — when the power to enact said policy is yours alone. And the stakes of regulatory and monetary policy are enormous. Whether the next Democratic president’s Federal Reserve nominees prioritize unemployment or inflation could have massive implications for American workers. And how that president’s SEC nominees understand Wall Street’s role in the U.S. economy will, too. What’s more, a sufficiently progressive Democratic president could potentially enact sweeping policy changes — without Congress — by aggressively reinterpreting existing statutes. The government can use its power of eminent domain, allowing it to acquire the land for a reasonable price … The government should employ an analogous power — government patent use — to negotiate lower prices, or buy low-cost, generic versions of drugs for use in government programs. This is possible because existing law gives the federal government limited immunity to challenges from patent holders: Patent holders cannot stop the government from making or buying products that infringe on their patents, and can sue only for reasonable compensation. A promise to take on Pharma directly through this sort of measure could prove more valuable than a pledge to try to pass single-payer. Further, a Democratic president could also unilaterally establish a nationwide system of public banks. As a self-funded agency, the postal service has the authority to pursue revenue-raising schemes on its own volition. Thus, under a committed administration, the agency could start providing retail banking services at its 30,000 locations without Joe Manchin’s permission. It is exceedingly difficult to pass laws in the United States; but for that very reason, it is also hard to repeal them. Thus, progressives should spend a bit more energy scouring existing statutes for opportunities to advance their agenda. That way, they’ll be able to get 2020 candidates to make radical policy promises that they will definitely have the power to keep.